Is seen in all these! We dance about without a care. I hear a lonely cricket call. My aching heart finds peace. All my inner struggles cease. Lightning falls from the sky. And darkness turn to day? And end our dark despair. The true light ne'er departs. Will never get you better pay. When they really just don't feel that way. That makes you feel your very best. To rise and wake your inner elf. That will help you find the grace. Play your part and take a bow. Fairy, fairy, rise and shine! Let it fill you, head to toe. Go plant your magic beanstalk vine! ‘Twould make your heart to glow. Does it become an unfairy? Is their a fairness fairy? Is it then more fairy? And the one that's been. Had none that could compare. Who would the winner be? Or could it even be me? All done up with such care. A brand new baby fae! Then go out to the garden, their work to do. Fallen flower petals are their soft little beds. So, to the woods, without delay! With fairy dances and songs sublime. To cook their dinner on before they retire. Of mystery and wonders, and all kinds of things! And home they go in the crisp night air. To work and laugh and dance and play! I could not stop her cries. And looked about the place. Or how she'd gotten here. She told me with a sigh. Of course I'd help her home! The tears all in the past. From morn till setting sun. A special treat today! 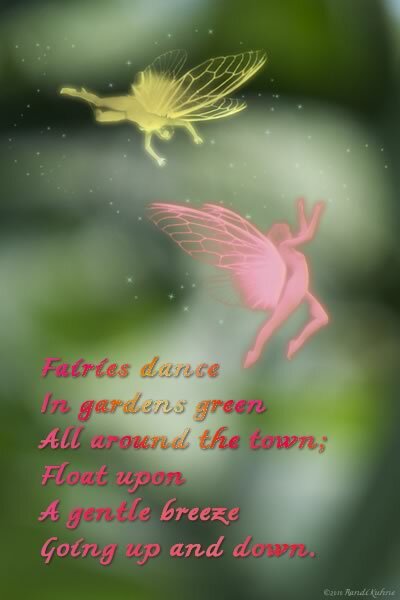 A simple fairy poem I wrote and illustrated. And some very special wishbones. To help a spirit soar. Then given in generous measure. Are no kind of fun. We'll be happier without him! We don't want you 'round here. And the air became clear. Wearing gold, pink, and green. On her head like a hill. As they dance and they fly. Fairies are found most everywhere! Look and you'll see some fairies go by. Where you'll see the fairies that bring the rains. You'll see fairies holding on tight to their tails! And have I mentioned the forest green? Oh yes, there will be some there, surely there will! Delighting all people with sparkly cheer! Some tempting cakes and tea. Then she'll freely fly away. Cavorting about until we're spent. The birds will twitter and bluebells ring. And if not, well, just pretend! She sighs and feels forlorn. How could she not be blue? Her life is far from ended. It all is in her hands. And make a brighter day. And so could you and I! And looks at their soft green leaves. And works both night and day. And leaves scars upon the land. A chair, a door, a dollar? To replace them takes much time. And for those in the coming days. I'm sure she will be pleased! Some cookies out to share. To give the fairy pleasure. Is to give it a gently try. And you may get some fairy surprises! And covered with drops like morning dew. Of the parched and dry and dusty earth. As rainbows and sunshine follow the rains. And she also knows that showers bring flowers. Adds to all their fun. Sit and rest and laugh. And windows filled with treats. To self and beast and man. And glitter for her wings. And other kinds of fluff. Shoes for her tiny feet. And shopped and shopped for hours! Was feeling quite her best. Go shopping with a list! Have you ever seen a fairy? And while away the hours. Plenty for you, and plenty for me!